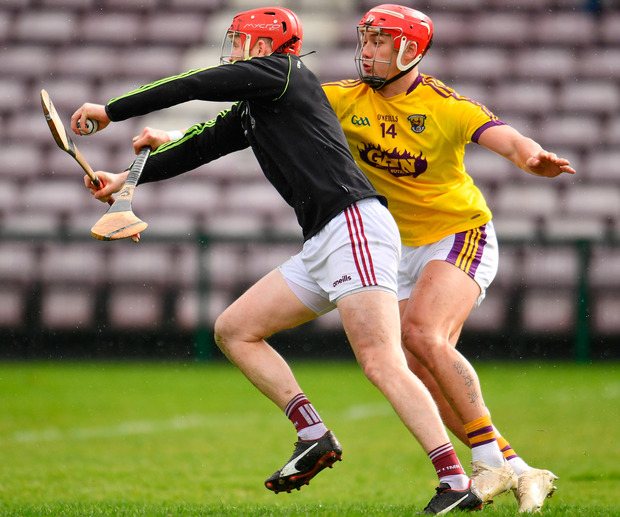 At half-time Wexford were in pole position, a point to the good after facing the strong wind, and with three goals banked against a Galway team missing a litany of star names. But in the 15 minutes after the break the home team showed the quality which made them All-Ireland champions two years ago, outscoring Wexford 2-5 to 0-1, and suddenly the match was done. Wexford have had a good league, with spirited wins over Cork and Tipp rounded off by an uplifting victory over Kilkenny last weekend. Under Davy Fitzgerald they had beaten Galway in the league in successive seasons. Last year they ended Galway's reign as league champions in the quarter-finals in Wexford Park. But this time Galway's dominance, once they got on top, was unequivocal. Wexford must return here on May 26 in the Leinster Championship, and they left yesterday with a foretaste of what might be in store. Joe Canning gave an almost flawless exhibition of striking from frees, scoring 13, missing just one, and adding a 65 and one beautiful point from play when he caught a Galway puck-out and ran on to score into the wind. Cathal Mannion was the only player aside from Canning to score in the first half, at the end of which Galway trailed 3-5 to 0-13, but after half-time Mannion stormed into the match and set the standard with a brilliant individual goal. With the point on, he went for blood, crashing a powerful shot past Mark Fanning two minutes after the interval. Six minutes later, Niall Burke scrambled home after Fanning saved an effort from Davy Glennon and from nowhere Galway had turned a contest into a procession, engineering a ten-point swing. Having relied on Canning's frees in the first half, they found their rhythm and pinged the ball about. Burke's goal was a case in point. The impressive Brian Concannon showed vision and a streak of ruthlessness in eschewing the point option by finding Glennon lurking behind the Wexford cover which created mayhem in the defence. Late in the match Canning was denied a goal by Fanning but the ball broke to sub Tadhg Haran, who finished with his first touch after being introduced. "I'd love to be able to tell you what went wrong," said Davy Fitzgerald on the second half turnaround. "I just don't know. We were well in control and we should have been up four or five points. But it has nothing to do with anyone except ourselves. Okay, Galway may have upped their game and they ran the ball a good bit and got space. I don't think we pushed up on them enough." A 14-3 foul count in Galway's favour in the first half drew the ire of Wexford fans, with Canning punishing them repeatedly. 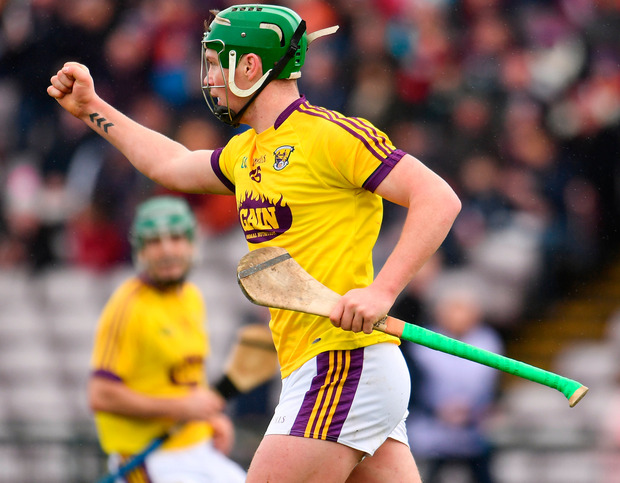 Wexford went with their usual sweeper arrangement and denied Galway a single goal chance, while Conor McDonald scored two goals, with a third by Lee Chin. Matthew O'Hanlon had a telling hand in McDonald's first goal on nine minutes, a ground-shot finish which Fergus Flannery should have stopped. McDonald hit a second after 24 minutes when O'Hanlon sent a cross-field ball in from the wing and the full-forward outfielded Paul Killeen before planting an excellent shot in the corner to put Wexford back in front, 2-4 to 0-18. On the half-hour they struck again when Flannery lost the ball after making a good save from Cathal Dunbar and Chin punished the error. Galway manager Micheál Donoghue felt they could have defended better in the first half, but enjoyed the significant improvement after the break. "That is the foundation for everything," he said of good defending, "even though the forwards get the plaudits." They head on to the semi-finals next weekend in high spirits. Scorers - Galway: J Canning 0-15 (0-13 fs, 0-1 65), C Mannion 1-2, N Burke 1-1, T Haran 1-0, B Concannon 0-2, C Whelan 0-1. Wexford: C McDonald 2-2 (0-1 f); L Chin 1-2; P Morris 0-4 (0-3 fs, 0-1 65), D O'Keeffe, M O'Hanlon, A Nolan 0-1. Galway: F Flannery; J Grealish, P Killeen, D Morrissey; A Harte, P Mannion, G McInerney; C Mannion, S Loftus; N Burke, J Canning, C Whelan; S Bleahene, B Concannon, T Monaghan. Subs: K Hussey for Mannion (inj 22 mins); D Glennon for Monaghan (inj 34); J Coen for Morrissey (half time); S Kilduff for Harte (63); T Haran for Bleahene (68). Wexford: M Fanning; D Reck, L Ryan, S Donohoe; P Foley, M O'Hanlon, S Murphy; J O'Connor, K Foley; A Nolan, L Chin, D O'Keeffe; C Dunbar, C McDonald, C McDonald, P Morris. Subs: D Byrne for Ryan (inj 39); L Og McGovern for J O'Connor (46); S Reck for Byrne (inj 52); I Byrne for Chin (inj 58); H Kehoe for Morris (69).